Grill setup: plenty of charcoal below, all air passages cleared of ash, and a pizza stone (porous side up for my glazed/porous stone) raised on two bricks to bring the pizza close to the hot lid of the ceramic grill. I let the charcoal burn for 90 minutes with the lid closed to get the entire grill up to 650-700 degrees (when I tried making a pizza earlier, it burned on the bottom before it fully cooked on the top– I think because the ceramic grill lid wasn’t hot enough– I could also try further raising the stone next time). The dough recipe is down at the bottom. After letting it rise overnight in the fridge, I pulled it out about an hour before the grill was ready and rolled out each crust on a floured board before transferring it to the peel (on a layer of coarse cornmeal), rubbing olive oil into it, sprinkling a little salt onto it, and then topping it. Each pizza only had to bake for 3 or maybe 4 minutes when the grill was at peak temperature (later in the evening the charcoal burned down and the grill dropped to 500-550 degrees– the pizzas still came out pretty well). We made 6 different pizzas in one evening for a small cocktail party with a group of friends– success! Mix all the dry ingredients except the yeast. Make a small depression in the middle of the dry ingredients and add the yeast there. Gradually pour the water/oil mixture into this depression, stirring in a small circle to dissolve the yeast and to gradually incorporate the flour into this. Turn the (quite wet and sticky) dough out onto a floured countertop and knead a dozen times. Place in an oiled bowl, cover with plastic wrap, let rise overnight in the fridge (take it out at least 15 minutes before making pizzas and divide it into 6 balls). The best part of having leftover pulled pork and salsa from New Year’s Eve dinner? It didn’t even need any sauce– I just squeezed a few limes over it. My friend judit turned me on to how well smoking treats pineapple– the low slow cook caramelizes it, and this sweetness helps balance the woody smoke. The meal turned out really well, if I may say so myself. After years of successfully cooking steak in a traditional way (salted a few hours ahead of time, then high heat on a grill or a skillet on the stovetop followed by a 5-10 minute rest), I gave the “reverse sear” technique a try. The general idea is to bake / roast the steak at lower temperature until it’s almost done, then sear each side on a hot grill. The slower, lower-temperature approach should gradually and uniformly cook the meat, while the sear browns the outer layer for flavor which maintaining the juicy center (especially on a thick steak). After trying this a few times, a simple weeknight compromise in the level of effort that works for me is to set up a grill for indirect cooking (fire on one side, steaks on the other) at around 275, roast the steaks with the lid closed until they’re at 115-120F internal temperature (20-40 minutes depending on thickness), take them out to rest while I open the vents and crank the grill up to high temperature (500F), then sear a minute or so on each side (final internal temp 125-130). I wouldn’t say I’m a convert to *always* cooking it in this way, or am convinced it automatically makes a better steak– but it works well and does give a bit more latitude in the timing, where plus or minus 1 minute doesn’t rapidly take you past medium-rare. In the future I’m curious to combine this with some fruit woods as a way to lightly smoke a steak, since it’s in the grill for longer than a traditional hot-seared steak. I threw a little brunch for friends, with homemade bagels, salmon and trout I smoked over alder wood, gravlax cured by H, dry farmed early girl tomatoes (so good…), salted cucumbers, and other accoutrements. For the trout and salmon I followed a four day “hot smoke” process based on the Russell Smallwood / Naked Whiz recipe. This produces savory, rich, cooked salmon and trout with a bit of a chewy crust– not a smoked cold/raw salmon like lox. Wednesday evening I made a plain salt brine (I wanted to start with the basics this time before getting into spices, herbs, or sugar) and immersed a thick 2lb block of salmon and 2lbs of cleaned trout fillets (both skin-on) in it under weights overnight. Thursday morning before work I rinsed the brine off both and set them out uncovered in a fridge to air dry for 36 hours, in the hope of developing more of a skin/pellicle when smoked. 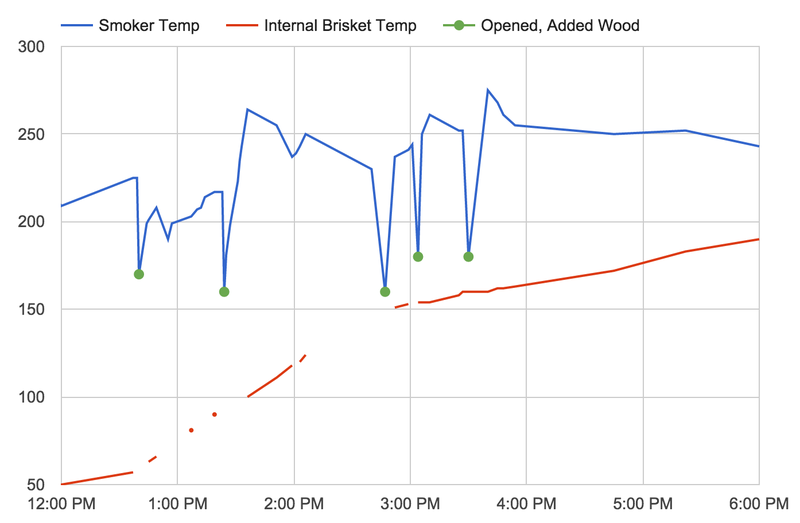 Friday night I fired up the kamado-style ceramic grill/smoker with lump charcoal and a few chunks of alder wood and stabilized it at the low temperature of 180°F (this took some effort and required sealing every spare crack of inlet space with foil to control the airflow). After one false start when I closed down the vents so much that I snuffed the fire, I got a steady slow burn going and popped in the salmon and trout. I let them smoke until 2AM (about 6 hours), which led to a heavily cured toothy smoked trout with a great skin, and a moderately cured salmon that was fully cooked but still moist in the middle (the salmon was much thicker to start– but I didn’t want to be getting up all night to check on it– maybe next time I’ll try a 12-hour smoke). I chilled the fish overnight, and Saturday morning they were ready to go for brunch. Mmm. I think the trout turned out amazingly good and have been snacking on it for days– I wouldn’t change anything. The salmon was also very good, but next time I want to try some more herbs and spices in the brine and perhaps a little sugar– and try smoking a part of it even longer to see if I can get a bit more of a dry “salmon jerky” crust outside the moist interior. Two Hour Tacos? 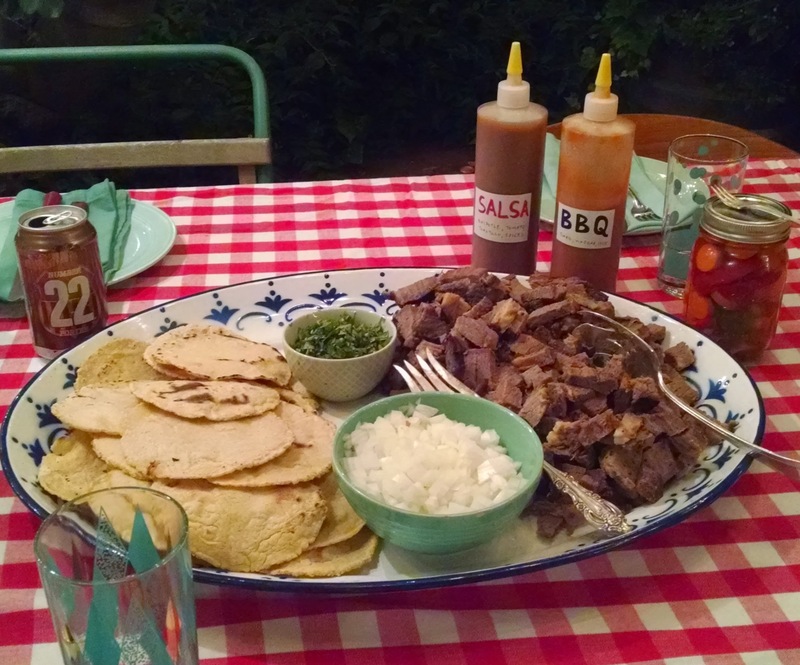 Why not Ten Hour Tacos, with a slow-smoked brisket, hand made tortillas, pickles, and a creamy BBQ sauce? We threw a dinner party inspired by a weekend trip to Far West Texas, and this is the story of the brisket. 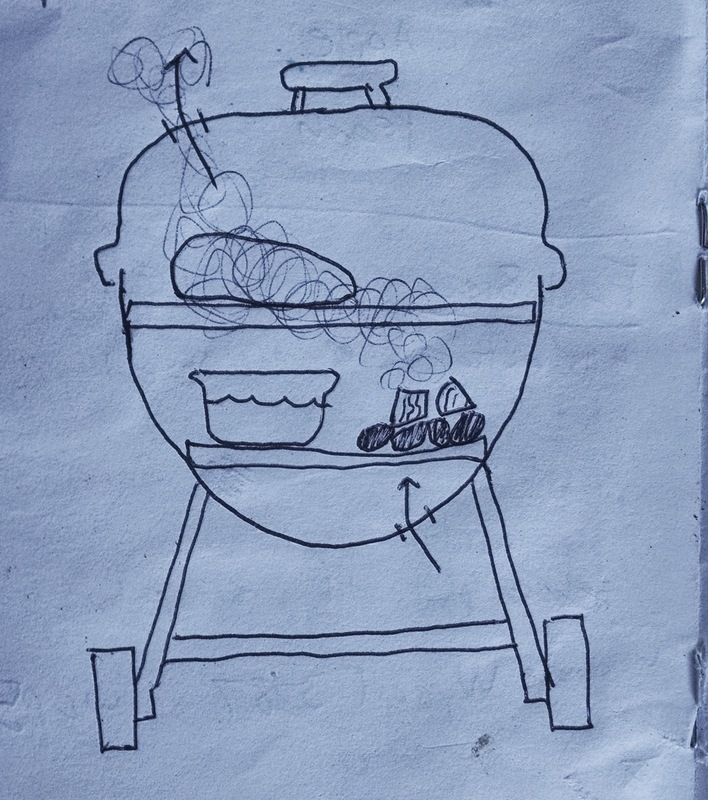 I’d never actually smoked meat before, though I knew the general principle of indirect heat / “slow and low”. 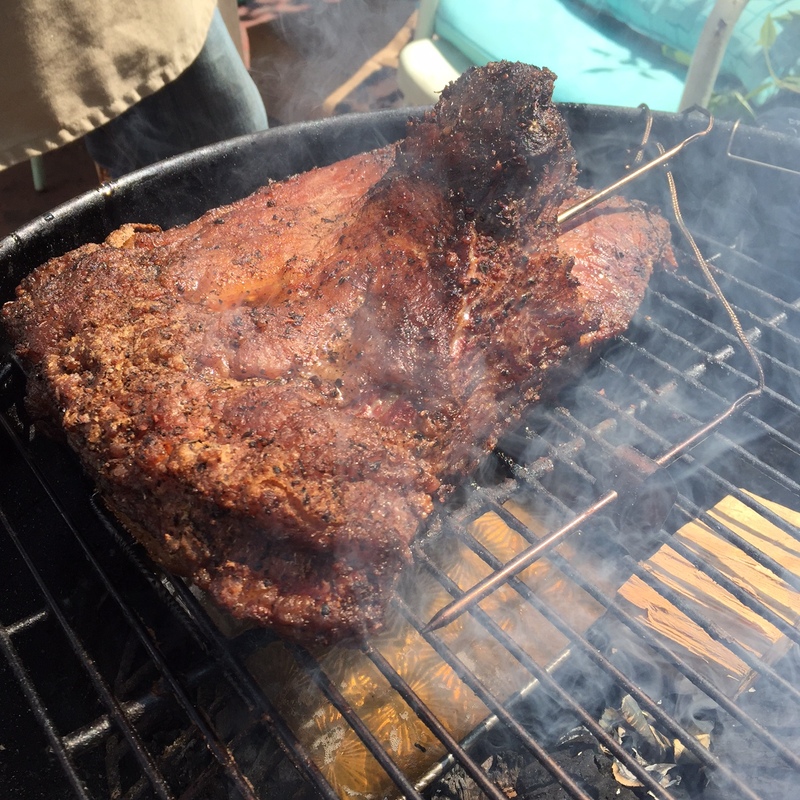 It became clear it wouldn’t just be a “set and forget it for 8 hours” process, and that there was a whole range of intuition, tweaking of the fire, and experience needed to get a good smoke. Well, there’s no real way to learn but by doing… so after browsing various online forums and getting pointed at this Saveur article, I had a general plan. I also spent a few evenings before the weekend getting sucked into web sites discussing the pros and cons of different styles and types of wood (for example: “Amazing Ribs: The Zen of Wood“) and even the Wikipedia page on charcoal itself. I settled on a common approach of using charcoal for the steady heat (since the porosity and composition of charcoal makes it much easier to adjust burn temperature by modulating airflow, compared to wood which would burn hot and fast), combined with a handful of wood chunks to produce the smoke (not chips which would require too frequent replenishment over what I expected to be an all-day affair). 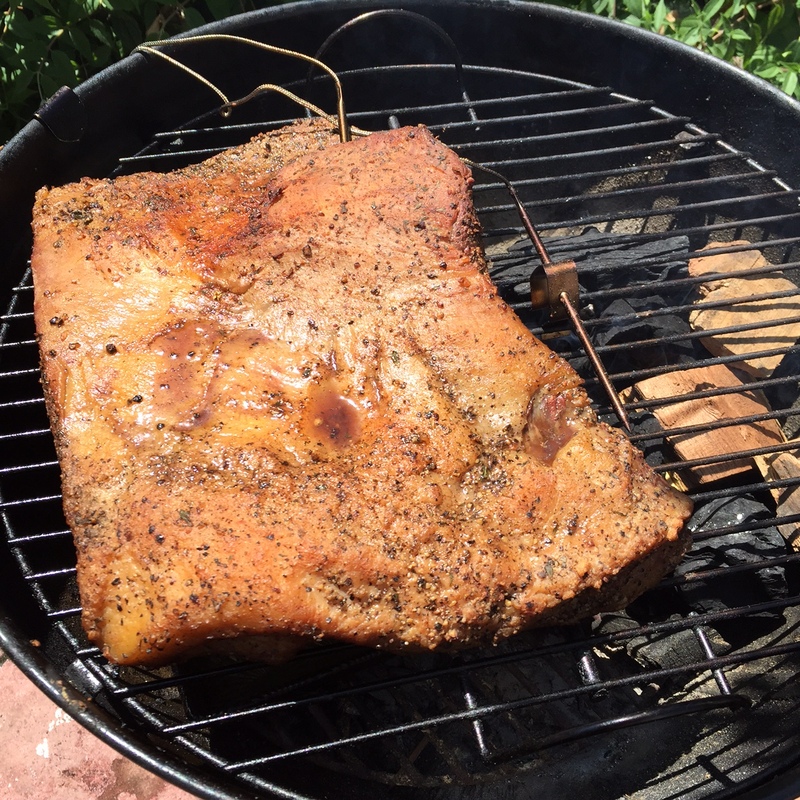 For the wood I chose a mix of mesquite for traditional flavor, cut a bit with milder hickory and sweeter applewood as there seems to be active debate whether an all-mesquite-wood smoke imparts too much bitterness over a long slow smoke like a brisket. Many hardware stores only carried charcoal and wood chips, but I found chunks of mesquite at the Cole Hardware on Mission St, and the OSH in Berkeley had an impressive entire aisle of wood chunks and chips of various types. For future smokes– I also read about BBQ Galore in San Rafael and Lazarri’s in Bayview (SF), though Lazarri’s is only open weekdays and I didn’t have time to make it over. Finally, after 8 hours outdoors in the mild sunny Bay Area weather tending meat with a beer on hand, it was done. I let the brisket rest an hour still wrapped to reabsorb its juices, then opened up the foil and diced it into cubes for the tacos. I don’t have quantities as the spicing was done to taste, but the vinegar, paprika, marash chili, and butter in particular came together to make an interesting, rich sauce with a background of slow-burn smokiness.